Last week, Los Angeles City Deputy Mayor, and soon-to-be Santa Monica City Manager, Rick Cole tweeted out a graph showing that Angelenos are driving less than we used to. In 2002, the average city resident drove 11.9 miles each day. By 2013, that daily Vehicle Miles Traveled (VMT) has declined to about 10.8 miles each day. I asked Cole for the source of the graph, and his only response, tweeted, was that it’s from an “L.A. City Planning Report.” Which report is not clear. The disembodied graph got picked up by L.A. Magazine, Curbed, and LAist. Streetsblog retweeted and put it atop our headlines. What has caused this shift in 2002? L.A. Magazine suggests that L.A. “has invested heavily in bike and transit infrastructure. Protected bike lanes have opened across the city, along with parking for cycles and sharrows painted on streets.” Curbed points to the changes having been “sped up” by the Measure R transportation sales tax. Hmmmm… This shift started in 2002. Measure R passed in 2008, and its rail, bus, and freeway projects take a few years to build. LADOT implemented its first sharrows in 2010, its first bike parking corral in 2011, and its first and only serious protected bike lane in 2015. LADOT did greatly step up implementation of bike lanes especially from 2010-2012, but I am still waiting for that “invested heavily” stuff. So, all those causes that L.A. Magazine and Curbed are pointing out took place in the later years on the right end of this graph, or or even to the right just off-graph. L.A.’s drop-off in per-person driving started in 2002, well before the transit and bike infrastructure we see today. I think it’s more likely that the last 5 years of somewhat-improved bike and transit facilities are a response to this trend, not a cause of it. I think that city agencies, elected officials, and experts are beginning to catch up with trends that are already happening on our streets. What’s the cause? Anyone who says they know is probably wrong, but I will go ahead and speculate later, at the end of the article. 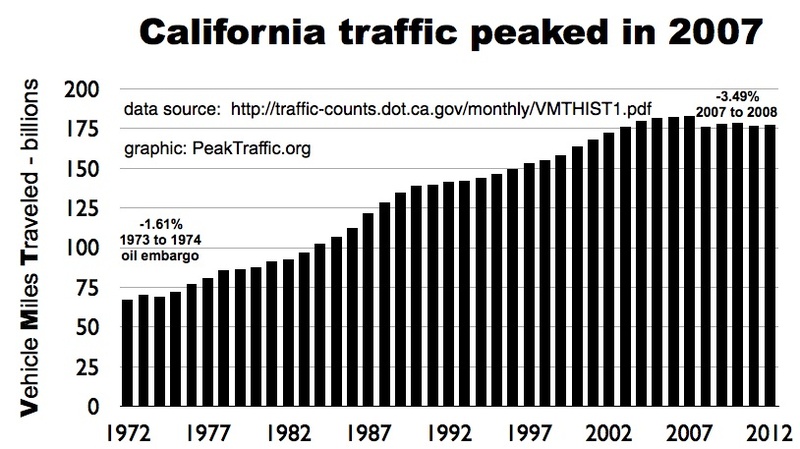 First, a look at how L.A. compares to other places where the declining VMT trend has been observed. Like Los Angeles, the national trend shows a declining per-capita driving for the past ten years. After increasing fairly steeply for decades, the U.S. per-capita driving begins to climb less steeply in the 1990s, then begins to decline around 2002. Different studies put the peak and decline in slightly different places, but the national trend has definitely been downward for about a decade. The national trend is mirrored by state trends. Some states saw VMT declining in the mid-1990s. 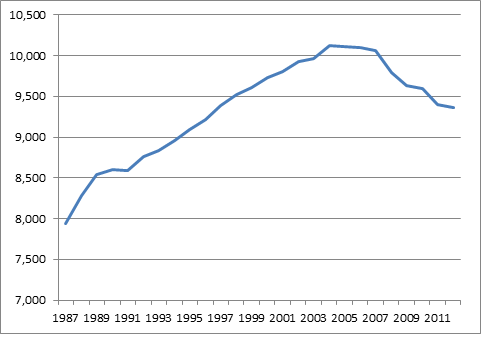 California per capita driving has declined since 2002-2003. Vehicle Miles Traveled in California has been on the decline for a couple of years. In California, overall driving, not just per-person driving, has been in decline since 2007. Nobody predicted this trend. Nobody. Sadly, though we’re at least a decade into declining per-person driving, very few transportation agencies and traffic engineers have incorporated these trends in their predictions of future car traffic. Engineers are still predicting that upticks, 1990s-style or 1970s-style, are right around the corner. Transit expert Jarrett Walker says that these aren’t really predictions, but denial. But it’s these kinds of nutty, unprofessional, faulty projections that result in unsafe designs for places like the Glendale-Hyperion Bridge. Car traffic has declined on that bridge for the last 10 years, but sadly L.A. City’s engineers are still predicting an uptick in car traffic through 2040. 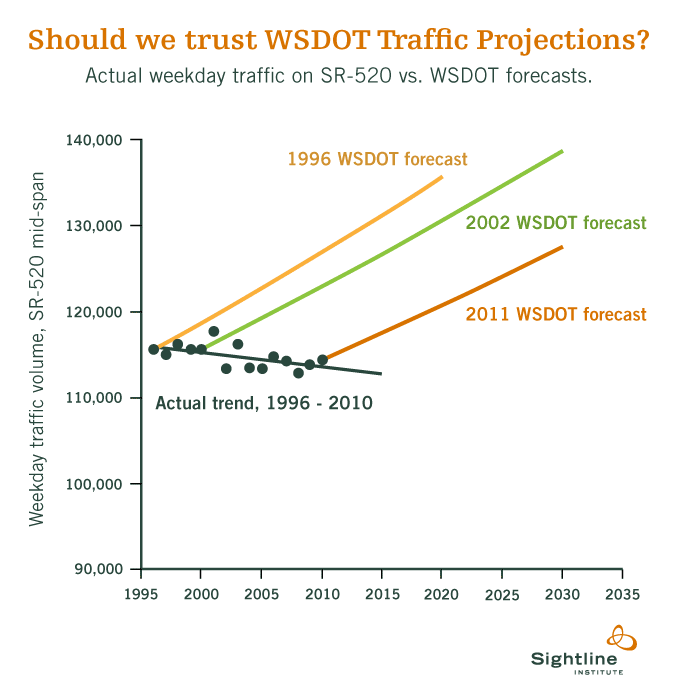 Only in late 2014 did some transportation agencies begun to the be honest and factual in their forecasts; see these graphs from Washington State. Will this honesty-in-predicting reach California or Los Angeles someday, more than a dozen years into the current trend? We’ll see. Apparently there’s a yet-to-be-released Planning Department report on the subject making the rounds with mayoral staff. That’s a start. Dear City Planning Department, please cc: the Bureau of Engineering and LADOT. My hunch is that these and other factors have played out gradually over time to reduce the amount of driving we do. Readers, what do you think? Why are Angelenos driving fewer miles? What should we do about it? Peggy Drouet: My comment to this article: The 710 tunnel will feed into the 210. The 210 East, for example, is already heavily congested from about 2 p.m. on and also on weekends. Adding more congestion to it is not going to solve the vehicle mobility problem, promoted as a need by both CalTrans and Barbara Messina. What can be easily seen to be needed in conjunction with the 710 tunnel is a new east-west freeway route, one that uses the 710 stub in Alhambra as a starting point and then transverses Alhambra to the 610, then to the 57, and all the way to the 15. Wouldn't this be the logical conclusion for the next attempt to keep the car culture alive in Los Angeles? I am sure that both CalTrans and Messina would go for this idea in the name of mobility and relieving congestion on other freeways. This March 6, 2015 staff file photo shows the end of the 710 Freeway at Valley Boulevard in Alhambra. By saying time is money, a new study of the 710 Freeway “gap closure” project concludes the tunnel option creates the highest benefit by getting people to work or home a little faster, with fewer accidents and less money spent on fuel and car repairs. The “Analysis of Costs and Benefits for the State Route 710 North Study Alternatives” favors a 6.3-mile single tunnel containing two traffic lanes in each direction located 250 feet under El Sereno/Los Angeles, South Pasadena and Pasadena. By trimming 7 minutes off a commute during peak hours and almost 14 minutes the rest of the time, the single tunnel, at a cost of $3.15 billion to build, works out to a benefit of $1.5 billion to $1.6 billion over 20 years for 2 million people living in the San Gabriel Valley, parts of Los Angeles and the east San Fernando Valley, the report concluded. “The Freeway Tunnel Alternative has the highest benefits regardless of costs,” concluded the report released by Caltrans over the weekend. Time saved is the most valued factor in the study, followed by cost savings for car owners and savings from fewer car crashes. The report says when commuters use the single-bore tunnel to get from the end of the 710 Freeway in El Sereno at the Alhambra border up to Pasadena at the 134/210 freeway interchange — about 90,000 cars per day — it would divert traffic from nearby surface streets which tend to have higher crash rates than freeways. This saves money, time and calculates into greater benefits. “The major issue also is that it will open up all the other freeways in the region. It frees up the interchange in downtown Los Angeles,” said Alhambra City Councilwoman Barbara Messina, a freeway tunnel proponent. However, a single-tunnel would not produce benefits in the area of tailpipe emissions. The report said a tunnel would be a “disbenefit” or increase costs from emissions in a focused area, presumably at tunnel portals on Valley Boulevard and north of Del Mar Avenue in Pasadena, and possibly where ventilators emit tunnel fumes. The issue of emissions has been raised by cities opposed to the tunnel: South Pasadena, Pasadena, Glendale, Sierra Madre and La Canada Flintridge. Bill Sherman, a retired physician and a member of South Pasadena’s Transportation Commission, said the cost-benefit analysis failed to consider health-care costs from tunnel pollution. “Ninety-thousand cars per day in the single tunnel, or 180,000 cars a day in the dual-bore (double tunnel option) will be entering and leaving the portals. Those fumes will come out of the exhaust pipes and go into Old Pasadena,” he said. He’s asking for a focused analysis on air emissions, known as a hot-spot study, as well as a calculation of economic costs of hospital visits and sick time to be included in the report. Anthony Portantino, a former state Assemblyman from La Canada Flintridge and tunnel opponent, had asked the California Transportation Commission to produce the cost-benefit analysis for more than a year. “It is a good starting point to have a conversation. But it concerns me whether it is truly adequate,” he said. Portantino wrote a letter to the CTC, which takes up the report on Thursday, asking that Caltrans and the Los Angeles County Metropolitan Transportation Authority known as Metro, adjust the formula for estimating cost. Metro uses $1 billion per mile for the proposed Sepulveda Pass Transit Corridor, a tunnel that would connect the San Fernando Valley with the L.A. basin, while Caltrans, in partnership with Metro, uses a half billion dollar figure for the 710 tunnel option. By underestimating construction costs, the cost-benefit analysis overestimates the benefits, he said. “They are not using an accurate funding model. Also, they are not anticipating the giant boring machine breaking down. What is the (economic) impact of that happening?” Portantino asked. He is asking the CTC to send comments to Caltrans and Metro to incorporate in the EIR a notice to homeowners their properties may be taken in order to dig out a boring machine stuck underground. Joann Nuckols, a member of the No 710 Action Committee, said Caltrans and Metro are deliberately underestimating the cost and benefits of a freeway tunnel. “It is basically fraud. They are overvaluing and underpricing the project,” Nuckols said, saying the tunnels would really cost $6 billion to $14 billion. Messina said the cost of either the single or double tunnel would be recouped by charging tolls, which would be used to pay back a private financier. The $40 million draft EIR/EIS, released in March, looks at five options: a no-build option; a traffic management system that would upgrade streets and sync traffic signals at local intersections to move traffic more quickly; a dedicated busway with high-frequency service; a 7.5-mile light-rail line that would stretch from East Los Angeles to Pasadena and a 6.3-mile freeway tunnel, of which 4.2 miles would be completely underground. While Caltrans has proposed “closing the 710 gap” for nearly 60 years, mostly as a surface route, the tunnel route has gained momentum since the release of the environmental document. Caltrans has extended the comment period for the EIR/EIS to Aug. 5. Send written comments to: Garrett Damrath, Caltrans District 7, Division of Environmental Planning, 100 S. Main St., MS-16, Los Angeles, CA 90012 or to http://www.sr710northcomments.com.